Intra-day strategies require far more dedication and discipline and therefore the technique and decision making for this trade should be simple and robust. In this webinar, we introduce a simple yet efficient way in which you will be able to answer which stock to buy or sell, and where to exit and book profits. This profitable trading strategy is based on sentiment, trend, and momentum. To pinpoint exactly which stocks to buy or sell for a particular trading day. Objective based trading decisions to be made with a complete focus on trades and not the market. To demonstrate that how with some discipline and method, profitable intra-day trading is very much a possibility and not a myth. Students will Learn a disciplined approach towards profitable intra-day trading. Students will learn how to pick stocks to buy or sell and levels beyond which you should place your orders and execute your trade. Students will understand how to scan the market and look for the best trading opportunities within 15mins of market opening. Great webinar! Time went fast and topics were well covered. Presentation/Tone was good the and pace was apt Voice got broken in between hope to get recorded session. Hope to find success while trading! 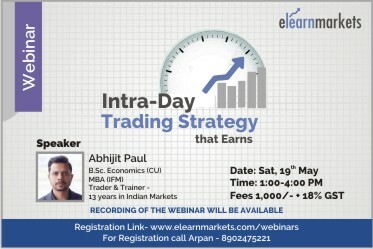 Great experience on webinar ,very knowledgeable with knew concept on trade intraday specially EOD with Aim and Shoot strategy. Most of us are not experts and participating this session, we are not exposed to advance softwares.If you use comon platforms for such trainning will be more useful. It was great to attend the webinar, and learn simple and yet effective intraday techniques. These techniques work in the current market scenario, It would be awesome if we are updated when the market timing change in October (most likely). Thanks.